CarGurus has 40,760 nationwide Encore listings starting at $5,995. A best-selling compact crossover for the past 2 years, Buick’s 5-passenger Encore offers a slew of upgrades for the 2017 model year. Among these enhancements are such styling changes as a new winged grille and front fascia, with the “winged” theme continuing on to LED wing-tipped headlights. There’s also a redesigned center stack and a few upgrades to the upscale comfort and convenience features that Buick is noted for. 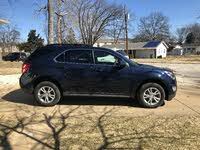 The 2017 Encore is anticipated to remain the nimble and efficient people-hauler that’s now accepted by both the media and consumers in general as a needed departure from Buick's staid, land-yacht image. The upcoming year’s reworked Encore returns available in 5 trims: the entry-level Base, the up-featured Convenience, the turbo Sport Touring, the posh Leather, and the flagship Premium. Look for the 2017 Encore to remain offered with standard front-wheel drive (FWD), with a full-time all-wheel-drive (AWD) system again optional on all trims. 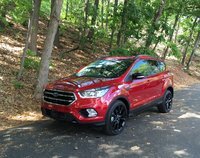 Further upgrades slated to enhance the 2017 Encore iterations include a new keyless unlock feature, push-button start, body-color heated power-adjustable outside mirrors, a new 18-inch wheel design, and 3 new exterior color choices: Ebony Twilight Metallic, White Frost Metallic, and Black Cherry Metallic. Also enhancing the exterior for the upcoming year’s Encore are such newly offered niceties as a chrome exhaust tip and LED taillights. Meanwhile, a new gauge cluster offers a 4.2-inch driver info display, while Apple CarPlay and Android Auto smartphone apps are slated to be added to the Encore’s Bluetooth-integrated IntelliLink infotainment system, which also boasts a new 8-inch touchscreen. Standard power for all trims other than the Sport Touring returns in the form of a 138-hp 1.4-liter inline 4-cylinder (I4) engine that’s mated to a 6-speed shiftable automatic transmission to put out 148 lb-ft of torque. Look for similar mileage to the current 25 mpg city/33 highway/28 combined in FWD trims and 23/30/26 in AWD variants. Buick, doubtless aware of the standard powerplant's underwhelming performance, debuted the Encore Sport Touring trim for the 2016 model year with the same 1.4-liter I4, but turbocharged for 153 hp and 177 lb-ft of torque. This force-fed I4 is also managed by the 6-speed shiftable automatic. Expect the Sport Touring to return for 2017 with mileage numbers mirroring the current 25/33/28 with FWD and 23/30/26 with AWD. As noted, upgraded 18-inch aluminum wheels and new color choices are available on the 2017 Encore lineup, while all trims will again include a roof rack. The Sport Touring also features a rear spoiler. Inside, depending on the trim selected, look for such returning features as leatherette or genuine leather upholstery, heated power-adjustable front seats, a fold-flat front passenger seat (for packing those extra-long items), and full power accessories, including memory for driver settings aboard the Premium trim. Many reviewers consider the Encore’s high-end cabin a bit cramped, and the 48.4 cubic feet of cargo area (with the rear seats folded) still falls short of more than a few rivals. Further trim-specific interior features are slated to include a rear-view camera, cruise control, telescoping tilt-wheel steering, front and rear parking sensors, and dual-zone automatic climate control with Sun Sensor technology. OnStar directions and connections telematics and GM’s Bluetooth-integrated IntelliLink system with 4G LTE Wi-Fi Hotspot capability return to higher 2017 Encore trims. Entertainment in all but the Premium trim is again expected to include a CD player with 6 speakers, satellite radio, and an auxiliary audio input. The 2017 Encore Premium, meantime, is anticipated to sport a Bose premium system and a subwoofer (for 7 total speakers). Noteworthy returning options are expected to include a power sunroof and GPS navigation, which are available only on the Leather and Premium trims. Expected safety equipment on the 2017 Encore lineup includes 4-wheel antilock brakes, traction and stability control, front and rear side-mounted airbags, front and rear head curtain airbags, daytime running lights, turn-signal-integrated mirrors, OnStar emergency communications and alerts, a post-collision safety system, and a remote antitheft alarm. Additionally, look for all trims other than the Base to add a blind-spot monitor and rear cross-traffic alert, while the Premium is expected to throw in a standard lane-departure warning system and forward collision alert. The current Encore gets the government’s best 5-star safety rating in crash tests, while the Insurance Institute for Highway Safety gives the 2016 Encore its highest score of Good on all safety tests. Look for the refreshed 2017 Buick Encore to begin appearing in dealer showrooms in the third quarter of this year, when it’ll again challenge the likes of Honda’s HR-V, Mazda’s CX-3, and Fiat’s 500X. 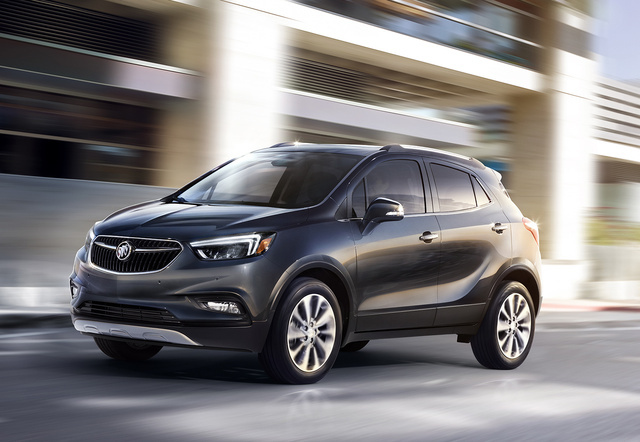 What's your take on the 2017 Buick Encore? Shari OMG, you're crazy, this is not ugly ! Just got a new 2017 this past weekend (for a great deal, I must say) Its got everything pretty much (Preferred model) Its actually for my daughter, a grad student.... and If we could get two more we would, but we are in a lease and can't for another year and half, but this would be my first choice when I have the chance. Users ranked 2017 Buick Encore against other cars which they drove/owned. Each ranking was based on 9 categories. Here is the summary of top rankings. Have you driven a 2017 Buick Encore? What is the better option, GMC Terrain, Buick Encore Preferred, or Jeep's mid size SUV?